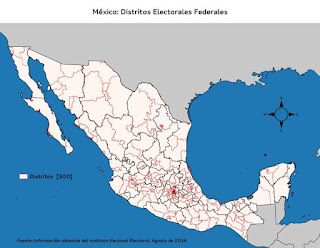 300 are elected directly from Mexico's federal electoral districts, which were last updated in 2017. Federal electoral districts are assigned by population, but states must have at least two. These deputees are called Diputados electos por mayoría relativa. The other 200 deputees are elected proportionally, based on lists that are assigned to five circunscripciones electorales, which were last updated in 2011. Each circunscripción elects 40 deputees based on the proportional representation of the votes for every political party in that circunscripción. These deputees are called Diputados electos por representación proporcional plurinominal. 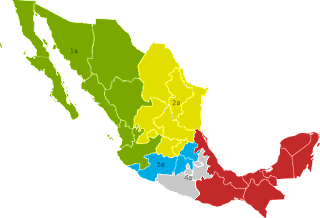 The heads of the five circunscripciones are Guadalajara, Monterrey, Toluca, Mexico City, and Xalapa. First 96 Senators: 3 Senators represent each state and Mexico City. Each political party or coalition must register two candidates with their two alternates. These are called the first and second formulas. The third senator is elected by representing the first formula of the party or coalition that got second place in the election, as measured by number of votes. This is called the Primera minoría. Other 32 Senators: Elected by proportional representation. Each political party must register a list of 32 Senate candidates to be elected by proportional representation. These senators are chosen depending on the number of votes each political party wins in the national election for the Senate.